Busy week with the painting and drawing. 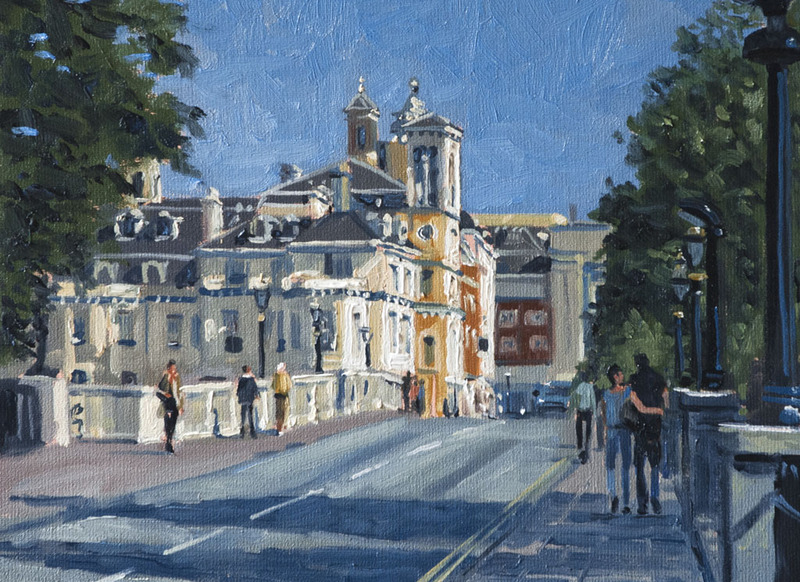 I went up to the centre of London, to attempt a slightly larger than normal plein air… and it did not go well. I set up in Long Acre in Covent Garden, as it was a Saturday it was very busy. Nonetheless I found a spot with my back to a bin and a signpost that did not discommode passers by. The light was beautiful it was one of those days with broken clouds where the sun suddenly lights up the street and then is gone. I soon realised that with the complexity of the scene and the transience of the light completing a big panel was not going to happen, so I just tried to block in the most important things, pausing when the sun came out to take quick snaps with my camera. I had barely covered over the last of the ground when I was asked to move on by the law, I considered arguing, but from experience I know it’s best not. They probably thought I was commissioned by Al Qaeda to paint possible terrorist targets! In truth I was not sorry to stop. Thinking what I would need to finish the painting I sketched and photographed the shoppers so I would have a good selection of figures when I came to finish the painting off. Painting can be clicked for a bigger view. This was quite a challenge as it had a lot of elements to balance. I drew out my shoppers on black paper and moved them around until I felt I had a decent flow of activity. I wanted the eye to end up going off down to the distance and the sky so I opened up a river of light reinforced by the strong perspective of the road. 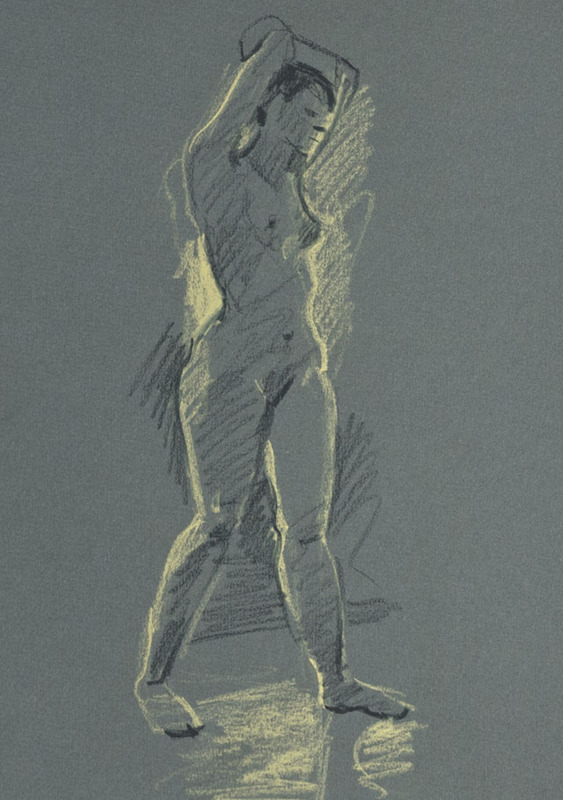 I was very glad to have my rough sketch underneath as the photos just didn’t convey the brilliance of the light. I spent quite a while at the end suppressing unneeded detail and toning back areas that caused interruption to the eye. 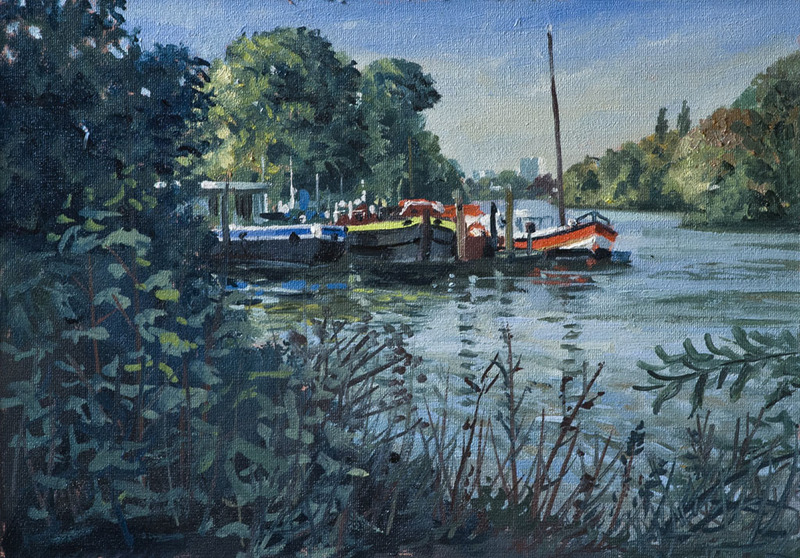 I have been intending to paint some historical views of the docks and the Thames for a while. Some weeks ago I painted a plein air of the Tate modern at Bankside that had lighting that I thought could well give the mood to another painting. I decided to substitute Battersea power station in full operation rather than the sad hulk it has become. I had a couple of old photos, but they were not wide enough for the painting I had in mind which was a double square, a proportion I have been wanting to try out for a while. I had recently bought stretchers from the wonderful Russell and Chapple in Drury Lane. So it was off to the internet to find old pictures of what was there upstream and down stream of the power station. While looking for these I also, as luck would have it, came across a perfect picture of a tug butting it’s way upstream. With these ingredients assembled and my plein air perched in view I spent a very rewarding afternoon gluing them all together with paint! 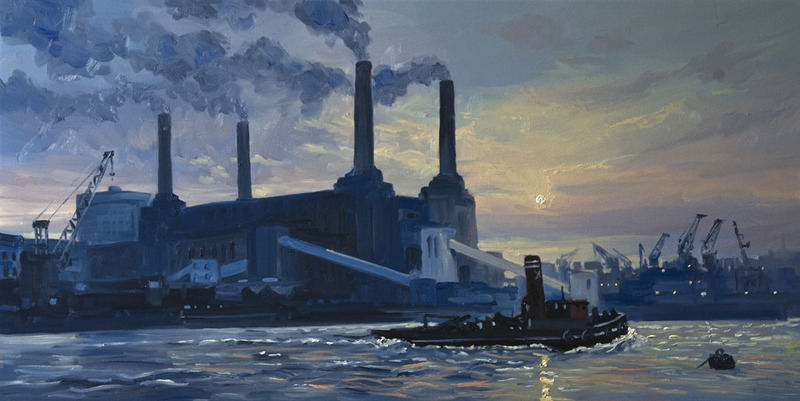 I had to be very careful with the tones here, I wanted the focus to be subtle and the mood to be the most important thing so nothing dominates… not an easy ambition when a monster like Battersea Powerstation and its chimneys fill half the canvas! This is actually the reason why the tug is important as weakens the presence of the looming building. I was interrupted by a delivery and when I got back upstairs and saw it afresh it suddenly looked complete so I added only a few tidy ups and called it done. I have been trying to do more sketches… and made up some books with paper I like, sadly I’ve only done two, both are dry runs for oil paintings. 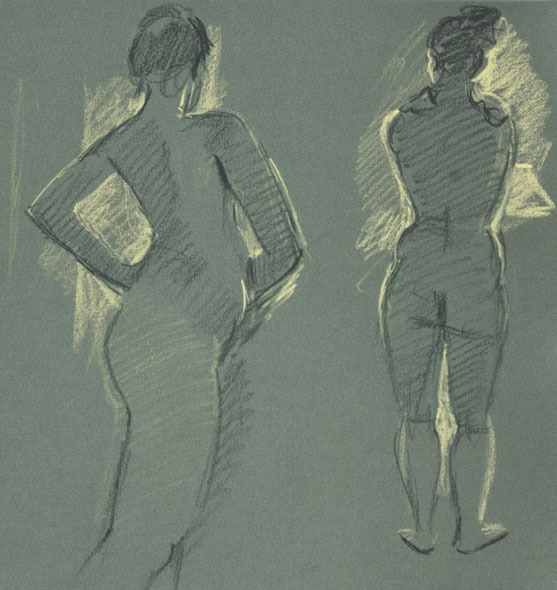 These and a few life drawings rounds off this post and my week. 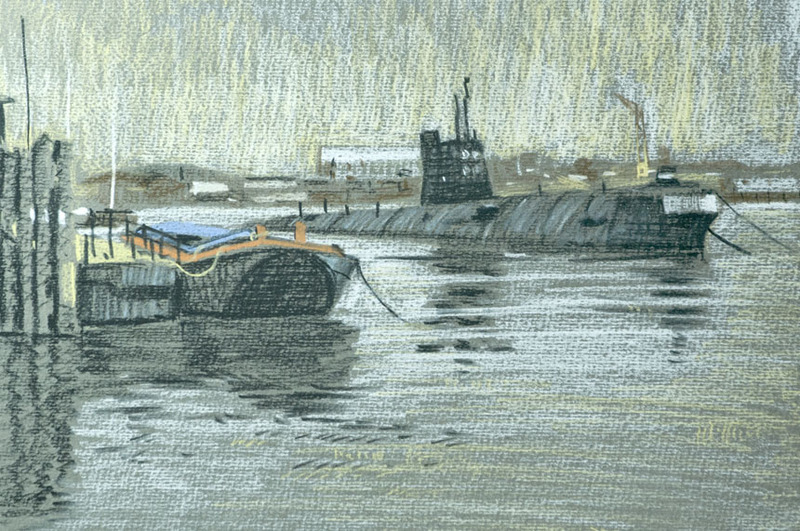 This is of a russian sub on the Medway. 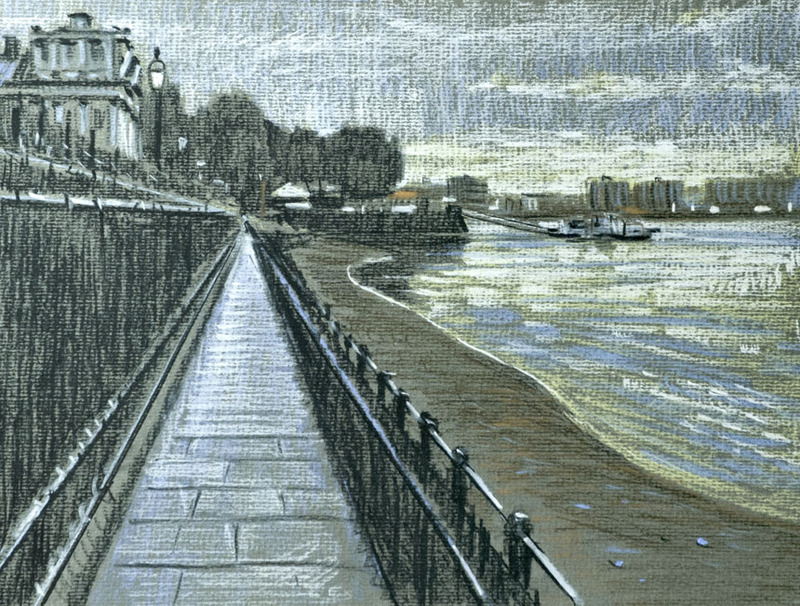 I’ve drawn and painted this path in Greenwich by the Naval Hospital many times… but once more won’t harm! It’s a great pleasure to draw the figure, absurdly difficult but wonderful. Another day out painting with the Wapping Group who kindly invited me along as a guest. As the forecast was predicting a lovely day I set out early arriving at about 8.30AM. I was glad I had made the effort as the light was beautiful. 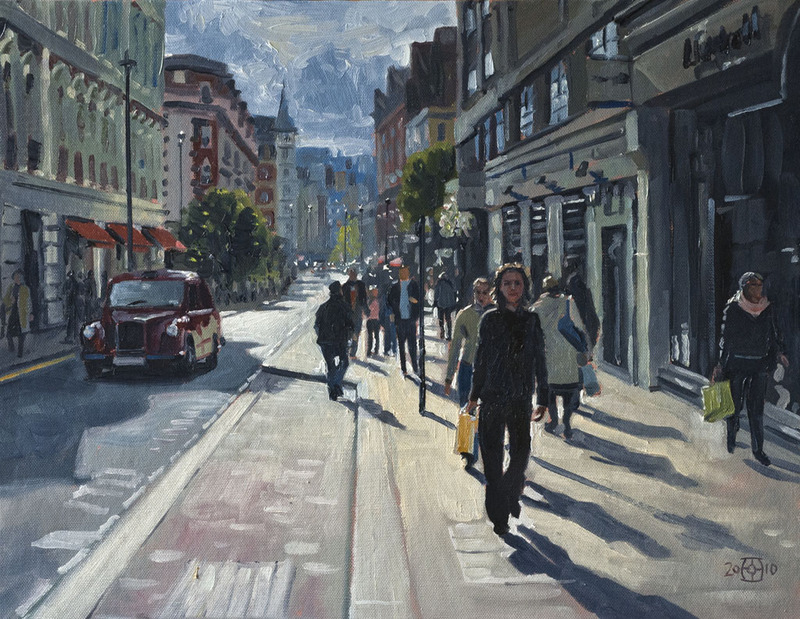 I set too immediately painting into the light, plenty of passers by, all nice and polite today asking if they may look, which isn’t always the case. Members of the group rolled up as I worked and exchanged pleasantries then set off to find their own spots. I was in need of sustenance and most of all coffee, so I combined getting breakfast with a stroll out one side of the river and returning via the other bank. Lots of lovely subjects, spoilt for choice indeed, I could see the day would be a good one, the river and the many bridges all looked delightful. 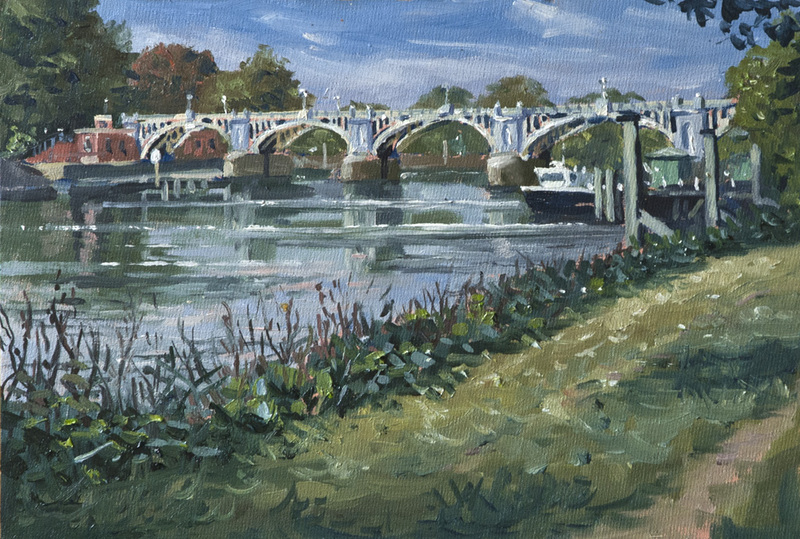 Next I painted Richmond lock, a lacy confection of iron work spanning the river. There is scarcely anything more pleasant than painting a scene like this in a lovely spot on a grand warm day! 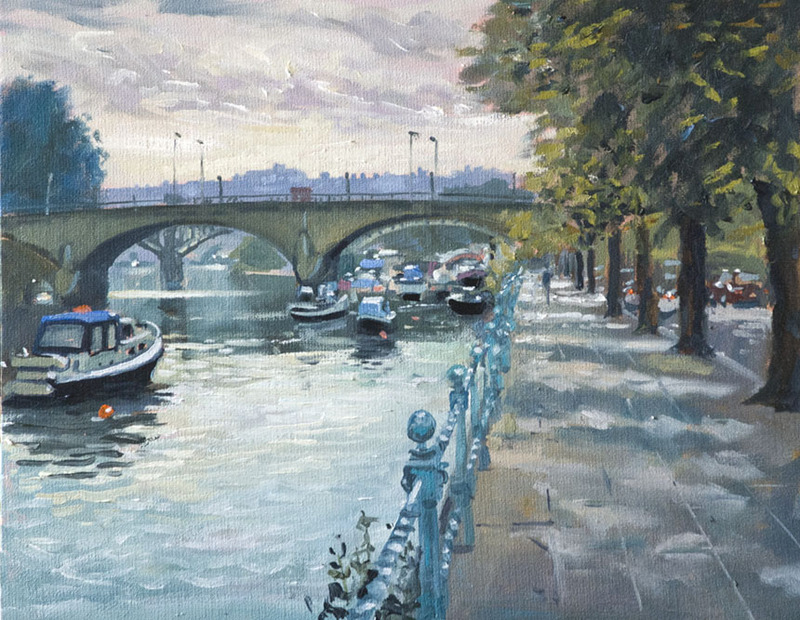 After finishing this I felt I needed something with a slightly lower “bridge” content, so I walked down stream and spent a relaxing hour or so painting some house boats and barges. I thought I was all done with painting as it was half five, so I walked towards the pub with a vision of ice cream before me. There were painters dotting the banks en route busy working away. 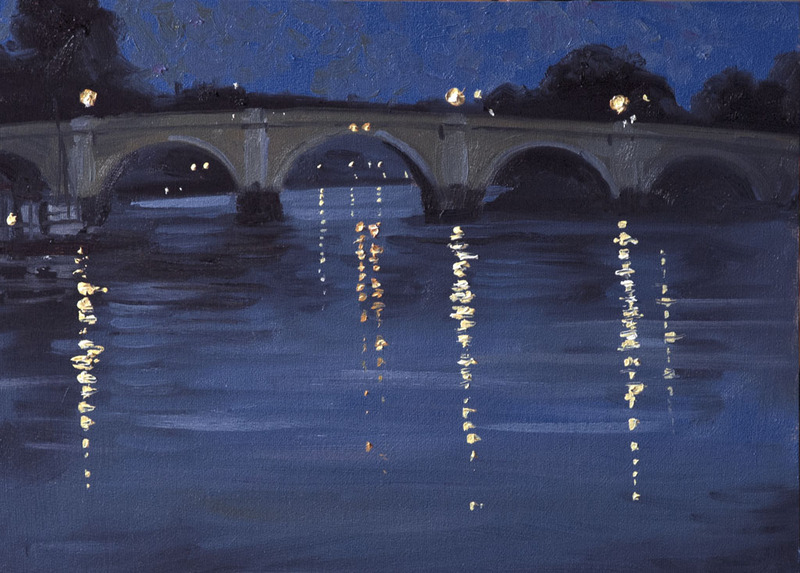 After pleasant chat and food in the pub I set off home but my eye was caught by how lovely the river looked in the twilight with the lamps shining out on the bridge. So off to the car and back with my pochade to spend 15 min dashing off a quick sketch. Once home I did a slightly larger one as I had the paints still wet on the palette and used an earlier photo to get the drawing. After that lot I was completely knackered and slept like a log! Some of the images can be clicked for a larger view. Here is my first of the day, I had to daub quite quickly as the brightening light was changing for the worse as I painted. There was a forground fisherman but I removed him as he blocked the flow into the frame. I don’t often make changes to plein airs but sometimes I will remove things that are distracting or simplify passages that are too busy. This is Richmond lock a wonderfully extravagant construction. I tried very hard to not get too fussy, but when your subject is like a doily made out of painted wrought iron, there is a good excuse for a bit of gratuitous detail. These barges were light relief after all that complication so I had fun doing this. I would like to have got a wider view but the tide was right up so I was restricted to painting from the path. I might go back and do this again as I haven’t really done it justice here. Here’s my final on the spot sketch this is tiny, only 5in across, but I was tired and tried to just dash the essentials down. I retained the colours on the palette so I could do a more a better drawn version easily once home. My work light was a rather orangey street light so I attempted to correct for the bias which makes mixing colours a bit hit or miss. Once home though they looked mostly right. Here’s the larger version, now I see them in the morning I don’t know which I prefer. Possibly the smaller as it is a bit fresher in feel. This is so often the case that the character of on the spot work is hard to carry over into a studio painting. 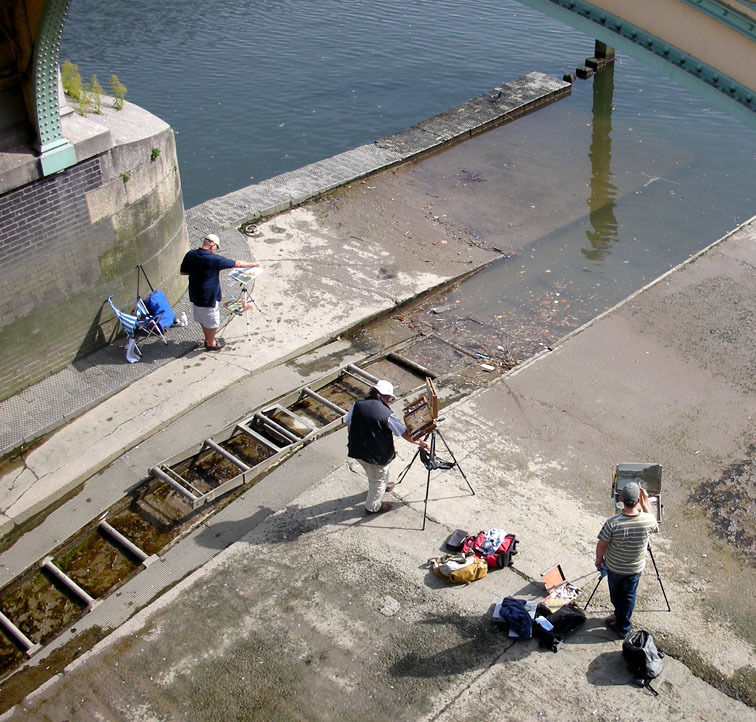 Here’s some members of the Wapping Group risking their lives for art in the lock itself. 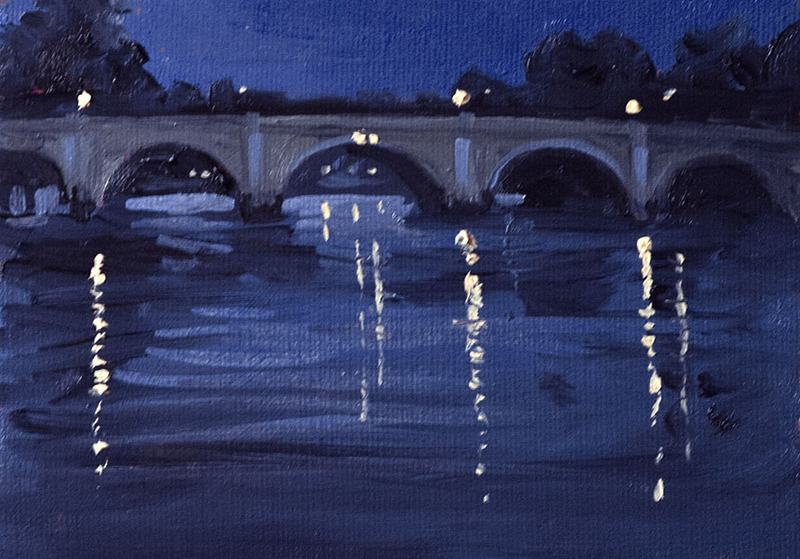 I took a photo I rather liked on Richmond Bridge, as I knew I was going back a few days later I drew out and blocked in on a board the basic forms tones and drawing, but with no detail really at all, just simple blocked out areas. As luck would have it Friday morning was lovely first thing so once set up I could paint away and had it finished in 40 min. I indicated figures just to get relative heights and then tidied up the nearer ones from references later. I’ll do this again as it is a very good way to tackle a fairly complex subject when the light might be changing fast.